Oh, Honey! 3 Household Acne Treatments- How to Use Them and Why They Work! Like so many of us lucky ladies and gents, my hormonal teenage acne didn’t magically disappear on the eve of my twentieth birthday. As I delved into my early twenties, I came to realize that the Benzoyl peroxide facial cleansers of my youth no longer fixed my unbalanced skin. In the search to quell my angry spots, I found myself digging through my kitchen cabinets and experimenting with do-it-yourself acne remedies like a mad scientist. From sugar scrubs to aspirin masks, I have tried it all, and these are my three favorite, inexpensive, readily available, and effective household skin-savers! Let’s imagine a scenario: You come home from work or class one evening, wash your face and notice a new pimple forming under your skin. You reach for your benzoyl peroxide- based spot treatment when, oh no! You’re all out! Don’t worry, honey will do the trick! Honey is a natural antibacterial, which makes it a great spot treatment. Acne is partially caused by bacteria in the skin. 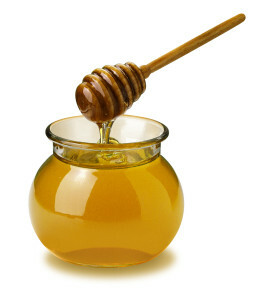 By applying honey, you help to cease the production of bacteria in the effected area. Honey is also an anti-inflammatory, meaning that it brings down swelling in the skin. This makes honey especially effective on angry, swollen cystic pimples! I personally used Raw Manuka Honey. I found that the less processed the honey was, the better its natural healing properties worked. For honey to be “raw” it must be unheated, unpasteurized and unprocessed. Some raw honey may even come with a piece of honeycomb left inside the jar! Don’t worry if you don’t have raw honey readily available, any honey in your kitchen cabinets will do, but if you like the results, you may want to upgrade! The application of the honey is simple: thoroughly wash your hands with warm water, then take a pea-sized amount of honey on your finger, and lightly dab it onto the problem area of the face. I would recommend dabbing, not rubbing- we don’t want our fingers dragging over sensitive skin. Once the effected area is covered, simply go about your night. Some honey-users recommend putting a band aid over the honey and sleeping with it on. I, for one, have never left it on overnight, but if you want to experiment, go for it! If not, do as I do and simply wash the honey off with warm water after a few hours. That’s it! ACV works wonders as a natural facial toner. The acetic acid in ACV is a natural astringent and helps to reset the PH-level of your face’s protective acid-mantle. When we wash our face with various scrubs and cleaners, we run the risk of buffing away this natural oil layer, which serves to keep out infection. ACV helps to add back the acidity that our skin needs- a happy acid-mantle equals a well balanced face! When I made this toner at home, I used Bragg’s Apple Cider Vinegar, which is unfiltered, unheated and USDA certified organic! By doing this, I insured that all the natural benefits of the vinegar would be intact. I rinsed out an old facial toner spray bottle I had laying around (you can also pick one up from any pharmacy on the cheap!) and filled it three quarters of the way with ACV, then topped off the bottle with distilled water to dilute the acidity before applying it to my face. I chose distilled water because it has the majority of its impurities steamed out, and you want your toner as pure and clean as you can get it. And remember, everyone’s skin is different! 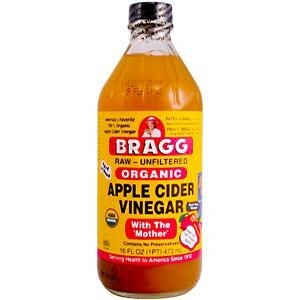 I used quite a lot of ACV in my mixture, but that may be too intense for some faces! Experiment with your ratios; some faces may need more h2o! Tip: If you have sensitive or dry skin, hold your mixture in a spray bottle about 6 inches away from your face and mist it over your skin- do not wipe or rub! Some ACV users recommend wiping an ACV-soaked cotton pad across the face, but I have found that letting the ACV sink in on it own works just as well, and you avoid rubbing the skin, which can cause irritation! After the toner has settled, follow up with your favorite moisturizer, and you’re done! Let’s get one thing straight, if Extra Virgin Olive Oil were a person, we would be married. No household item has done more for my face than EVO, and I am in love! I have been using olive oil on my face every night before bed for years now and I can’t describe how much smoother, more supple, moisturized, and balanced my skin looks. If you’re thinking, “I can’t put oil on my face! No way!” have no fears! This amazing oil closely mirrors our skin’s natural sebum production, and our body readily accepts it! Seeing as sebum itself is a necessary oil human bodies naturally produce, olive oil won’t clog your pores, but instead, add back the much needed moisture that your skin is lacking. If your skin is dry, you can already understand why this addition of oils is necessary, but if your skin is naturally oily, don’t be afraid of giving EVO a try! The sebum-like oils in EVO will help reformat your face’s oil production, telling your skin to stop over-producing oils because it’s now being effectively hydrated. As someone who has suffered from both oily and dry skin, I can attest to the fact that nothing has returned my skin to its “normal” state like EVO. I have always kept a glass bottle of EVO next to my bathroom sink. At night, I wet my face with warm water, pour a small amount of the oil into my palm (the amount varies), put my hands together to get the EVO evenly distributed, and then I set to work gently rubbing the oil all over my cheeks, chin, and forehead in small, circular strokes. 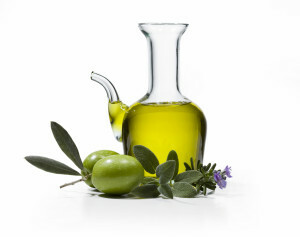 Tip: Olive Oil makes a great makeup remover! For this, I always remove my eye makeup first, rubbing a small amount of EVO onto my lids and eyelashes and then rinsing the makeup off my hands and face with warm water before continuing onto the rest of my face. After my face is thoroughly covered with EVO, I turn the water from warm to hot and gently rinse my face, letting the heat melt away some of the excess oil. I then wash my face with my normal cleanser, and at the end of my routine, I either use more EVO as a moisturizer, or mix a bit with a brand moisturizer I may be using. And voilà, you’re done! Remember, as with any skin regimen, these treatments wont work for everyone. Keep any allergies in mind before applying these items onto your face. Other than that, have fun pampering your skin with easily accessible (and delicious) treats! Good luck! Blogologues performed my story on stage, and it was hysterical! My Story is Being Performed on Stage! THE A.S.S. TALKS BACK AGAIN! - Blogologues Blogologues on My Top 3 WORST OKCupid Dates Of ALL TIME. admin on Top 5 Creepiest Murder Mysteries/Disappearances: Part 2! Powered by WordPress. Striker theme by Ossie.